Every year at the Crossboarder Blues, Brews, and Que competition the organizers, Carol and Frank have two extra categories in addition to the four standard KCBS entries. One is always an entry where you have to make something with your leftovers. The second category changes from year to year. This year the entry was Rethinking Chicken. Carol challenged teams to make a chicken entry that conforms to KCBS turn in rules, but did not conform to the rubbed and sauced standard that every team turns in every competition. Alabama White Sauce, go for it if you choose. Peri-Peri? Why not. While flipping through my one of m recipe feeds on Clipboard one evening, I found an entry that would definitely fit the "outside the box" spirit of this competition. As a matter of fact, the idea was not only outside the box, but it was off the table as well. I chose a Sticky Fish Sauce chicken. The recipe came from this website over at White on Rice Couple. It appealed to my tastes: sweet and sour with an Asian flair. Perfect for this competition. To practice, I whipped up a batch of sauce for some chicken I was grilling one night. I liked how it turned out. The honey started to caramelize and was complemented by the sriracha, lime, and fish sauce. A nice alternative to sweet American style chicken. We were a go for Wilson. 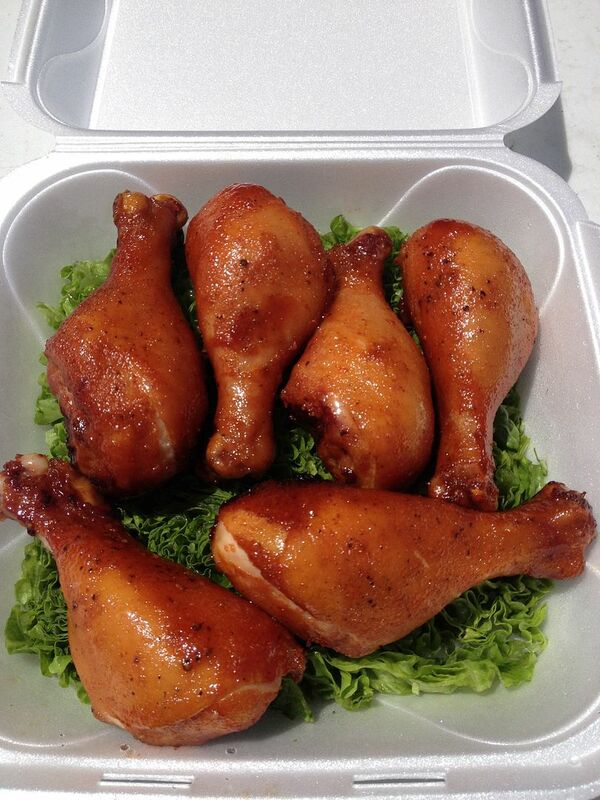 Come competition day, I chose legs for this entry and I also chose to cook using my KCBS chicken recipe with some changes. For seasoning, I lightly seasoned the chicken with garlic powder, onion powder, salt, and pepper. After the first 30 minutes on the smoker, I eliminated the butter bath component from the cooking method. Our cooking method turned out to be one and a half hours at 275 F. The legs were dunked in the sauce after 30 minutes and then cooked in a pan. After 30 more minutes, I reapplied the sauce and let the chicken cook for 30 minutes more. That is it. Our entry turned out pretty good. But, there was an issue. The fish sauce this time around was a bit on the overpowering side. I realized that the sauce needed that caramelization that you get from the grill. I should have finished these legs over a hot fire. Live and learn I suppose. The entry came in 22nd out of 27 teams. I would say though that we scored in the top 10 for Rethinking Chicken. Would I make chicken like this again? Yes I would, The Youngest scarfed these legs down. But, I would not use the smoker and make these strictly on the grill.